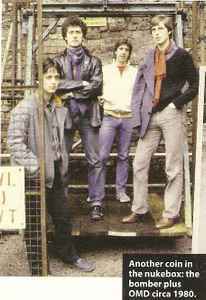 Formed in Wirral, Merseyside with Paul Humphreys (synthesizers) and Andy McCluskey (vocals and bass guitar). They played their first gig in 1978 at Eric's (Liverpool), then had a run of UK chart hits after swapping labels from Factory to the Virgin owned label DinDisc starting with the 1980 release 'Messages'. Although Humphreys left the group in 1989, McCluskey made a comeback in 1991 with the UK top 5 'Sailing On The Seven Seas', and followed that up with a UK top 3 Album 'Sugar Tax' before finally calling it a day in 1996. In 2007 they toured together again featuring the classic line-up of Andy McCluskey, Paul Humphreys, Malcolm Holmes and Martin Cooper and released a live-album in 2008: 'OMD Live: Architecture & Morality & More'. September 2010 saw the release of History Of Modern featuring the original classic line-up. The pinaccle of 80's synth. Gotta love moody lyrics attracted to epic riffs! Their first 4 albums are among the best of the 80s. That cold, layered, electronic wash mixed with mournful emotional vocals tingles the ears more than almost any other 80s artist. I can't get into anything after Junk Culture - although their last two albums, especially The Punishment of Luxury approach a return to form. Horrible forcing the electo while they sound amatheurish synth sonic-timbrewise. The concept of producing 80's albums nowadays is great but they just can't do it. Weak counterfeiting everywhere... Dull, boring compositions.... I'm very sorry. The best band of the 80s no question. I love all their work but their standouts are 'Junk Culture' & 'Crush'. So creative and quirky whilst still having their charm. Even their poppiest material is light years ahead of the turd chart music of today and the past 10-15 years to be honest. Long may they continue. A group of synth enthusiasts once confident enough to race with Kraftwerk on equal level, turned into a rock-band and it was certainly not by accident; it is the synth that might be part of the problem - once you exhaust it, what is there left to turn to but real instruments... early OMD were often given flattering epithets of combining ABBA and Joy Division influences. In case of their first five albums (experimentally fascinating 'OMD' and 'Organisation', confusingly subversive masterpieces 'Architecture & Morality' and 'Dazzle Ships'...), it is certainly true; from early minimal excursions into electronic extremes to their finest studio product ironically given the title 'Junk Culture' (1984), their name justifies every note - as the 80s progressed, many bands sacrificed patience and creativity for ambitious projects where egos outgrew frames of modesty - lush production doesn't always mean the goods are delivered in honest fashion; songs became too pretentious and embarrasingly sweet to listen to - while later on OMD managed to deliver a decent single (excellent 'So In Love' and 'Forever Live and Die'), the albums have long lost their course; 'Crush' is boring, 'The Pacific Age' is pointless, 'The Best of OMD' decently summarizes their pop-career up to 1988 while 90s' comeback attempts like 'Sugar Tax' (echoing tiny bits of 'Architecture & Morality' with wonderfully catchy 'Sailing on the Seven Seas' and 'Pandora's Box'), 'Liberator' or 'Universal' all sound more like frozen ideas from where the original line-up fell apart, trying desperately to catch up with trends of the moment - far better are their b-sides; from their earliest experiments to later superficiality, 'Navigation - The OMD B-sides' (2001) does offer the other side fully continued with technological efforts. Occasional retrospectives like the excellent 'Peel Sessions' collecting their broadcasted material from the most popular period of 1979 - 83 is also well worth a check. Remastered anthology is finally added singles and rarities as chronological counterparts which are not recommended only to fans but to anyone interested in hearing OMD as once true to their ideals.